Through Yoga we can liberate our mind by its schema and diagrams and pacify it, creating the conditions to armonize it with the cosmic, slow and natural rhythm of our body. Simona Brusoni was a dancer, both classic and modern style, and has also transitioned to the dance theater. Through the years she has traveled to India knowing herself and her body. She discovers Astanga yoga in 2001 with Lino Miele who becomes her teacher. She followed Lino in various retreats in Italy and abroad, as a student and then as his assistant. With him she was in Mysore for the first time in 2005 and returned there in the following years, attending the Ashtanga Yoga Research Institute of Sri. K. Pattabhi Jois. Encouraged by Lino, she began teaching in 2005. Simona is one of the founders of the school of Ashtanga yoga Milan (www.astangamilano.it), which was founded in 2009. In addition to her dedication to practice, Simona meditates in the tradition of Vipassana and studies the history of the Indian thought and philosophy. 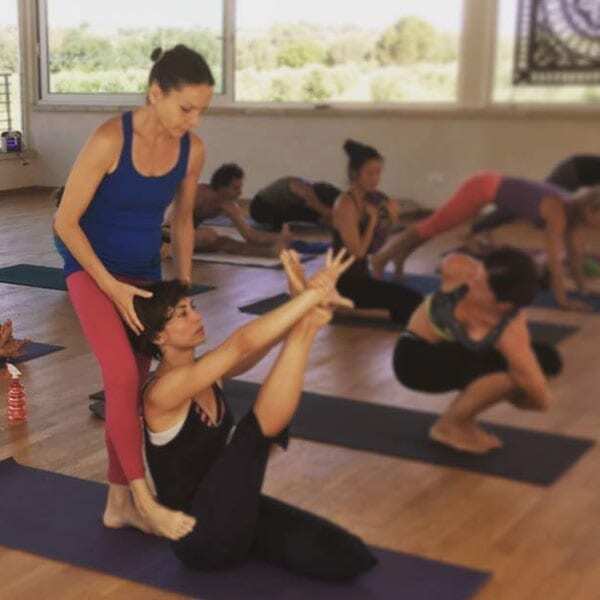 Now she has nearly completed the Advanced Series B (4th series) and in 2013 she approached Iyenger Yoga to improve her practice.